Background: There are very few epidemiological studies on the prevalence of hypertension and its risk factors among women in the rural population. This cross-sectional study was carried out to determine the same in a rural community. This study was carried out in a rural population of Maharashtra in a rural field practice area of a Medical college with which the author is affiliated. The present study is thus a novel effort to measure the burden related to hypertension and related sociodemographic factors in a rural setting among women aged >30 years. Materials and Methods: A random sample of 220 women of 30 years and above were selected from a rural area. The study participants were selected using simple random sampling technique using lottery method. Numbers were allotted to every individual. All the women were then listed. This became the sampling frame. An individual was taken as the sampling unit. The pre-tested pro forma was used to collect the data by trained doctors. Results: Maximum participants in the study were from age group 30–39 years (33.6%), followed by 40–49 years (23.2%). Mean and standard deviation (SD) of age among study participants was found to be 47.7 ± 13.4 years. A total of 155 (70.5%) of the study participants used tobacco in one or the other smokeless form. About 29.5% of the study participants never used tobacco in the lifetime. The most common form of smokeless tobacco consumption was Mishri (71.6%) followed by tobacco which was used by 27% of the participants. Supari was also consumed by few of the participants. About 51.4% of the participants consumed >5 g (World Health Organization recommended level) of salt per day. All the participants consumed extra salt in the form of pickle/papad/table salt over and above that consumed in meals. About 8.2% of the study participants were found to be underweight while 21.2% were overweight. 3.2% of the study participants were in Grade I obesity and only one (0.4%) was in morbid obesity category. 70% of the study participants who had waist-hip ratio ≤ 0.85, whereas 30% of them had ratio > 0.85. Nearly 52% of the study participants gave a positive family history of hypertension among first-degree relatives. Only 22 (68.7%) of those participants diagnosed with hypertension were taking antihypertensive drugs and nearly half of these participants 12 (54.5%) were taking regular medication. 34.1% of participants had systolic blood pressure (BP) >140 than mmHg (isolated systolic hypertension) while 37.2% had diastolic BP >90 mmHg (isolated diastolic hypertension). The mean systolic BP calculated was 130 mmHg with SD 20.7 with 95% confidence interval (CI) of mean to be 127.5–132.8 mmHg, whereas diastolic BP was 83 mmHg with SD 11.1 with 95% CI of mean to be 81.7–84.6 mmHg. The overall prevalence of hypertension among the study participants was calculated to be 23.6% with 95% CI to be 18.2–26.8 mmHg. Conclusion: Prevalence of systolic hypertension in rural community was 34.1% and of diastolic hypertension 37.2% with an overall prevalence of 23.6%. Significant associations were found between the presence of hypertension and various sociodemographic variables using Chi-square test. Furthermore, there was a significant association between hypertension and consumption of smokeless tobacco, low physical activity level. With rapid urbanization, industrialization and increasing level of affluence, the price which the society is paying is an enormous load of non-communicable diseases also referred to as life style diseases. The overall disease burden in India due to cardiovascular diseases accounts for 20% of all disability adjusted life years worldwide. Cardio vascular diseases have been identified as the leading risk factor for mortality, and is ranked third as a cause of disability-adjusted life-years. Overall, 26% of the adult population in 2000 had hypertension and 29% were projected to have this condition by 2025. Cardiovascular diseases are projected to remain the single leading cause of death. 9.4 million deaths each year, or 16.5% of all deaths can be attributed to high-blood pressure (BP). Earlier thought to be a problem of affluent society, concepts of chronic non communicable diseases have changed dramatically over the past few decades. Although they still remain a huge burden in developed countries, these countries have innovated strategies and means to provide effective curative services to their clientele by harnessing universal health coverage and dedicated research in this field. However, the scenario in developing countries like ours is very different. With genetic susceptibilities and changing sociodemographic landscape, resource constraints have placed an added load on the country's health systems in dealing with the growing epidemic of noncommunicable diseases. India accounts for one-sixth of the world's population, with the majority residing in rural settings. India is experiencing an alarming increase in heart diseases. The World Health Organization (WHO) estimates that 60% of the world's cardiac patients were Indian in 2010. India is undergoing an epidemiological transition and is on the threshold of an epidemic of cardiovascular diseases. The age presentation of acute coronary syndrome is about 5–10 years earlier in the Indian population in comparison to other countries of the developed world. It is a common belief that hypertension, is more common among men. The truth is nearly half of all adults with high BP are women. Women with high BP have a significantly higher risk for vascular disease than men who have the same elevated BP levels. The present study is thus an effort to measure the burden related to hypertension and related sociodemographic factors in a rural setting among women aged > 30 years and recommend suitable measures for its prevention. This study was designed to investigate the prevalence of hypertension in a rural community in the age group of 30 years and above. Sample size of 220 was calculated by simple random sampling assuming prevalence of hypertension as 17%, margin of error 5% with 95% confidence interval (CI). Informed consent was taken for interview and data collection. All households in the village were visited and the individuals meeting study criterion were interviewed. Pre-designed and pre-tested pro forma was used to collect the data. This pro forma included the personal particulars, family history of hypertension, details of major hypertension risk factors such as smoking, alcohol intake, physical activity, salt intake, saturated fat intake, anthropometric, and clinical data. All the instruments used in the study were calibrated before the commencement of the study. Body weight to nearest 0.5 kg and height to nearest 0.5 cm was measured using standardized techniques with an automated balance and a wall-mounted stadiometer. Semi-auto analyzer was used to determine fasting blood sugar and cholesterol levels. Body mass index (BMI) was calculated as Quetlet's Index (weight in kg/[Height in m ]). BP was measured on the right arm in sitting position using mercury sphygmomanometer after 5 min of rest so as the bladder encircles at least 80% of the circumference of the arm at the point midway between the olecranon and acromion. Three successive readings were taken at an interval of 3 min and the lowest reading was recorded as the BP. Hypertension was diagnosed according to Joint National Committee 7 criteria. Obesity and overweight were classified as per the WHO criteria  (Overweight was defined as BMI of >25 kg/m 2 and obesity as BMI of >30 kg/m 2). The data were analyzed using Statistical Software Package for Social Sciences (SPSS version 20). The prevalence rate of risk factors for hypertension with 95% CI was calculated. Chi-square test of independence was used for determining the relationship between the various risk factors and hypertension. Maximum participants in the current study were married (70.9%), followed by widows (27.3%), and separated (1.8%). There was no unmarried woman found in the current study. Maximum participants in the study were from the age group of 30–39 years (33.6%), followed by 40–49 years (23.2%). Mean and standard deviation (SD) of age among study participants was found to be 47.7 ± 13.4 years. BG Prasad's Scale based on per capita monthly income was used to classify the study participants into various socioeconomic classes. About 44% of participants belonged to Class IV (44.1%), followed by Class III (34.5%). Only four participants belonged to Class I (1.8%). Maximum numbers of females in the study were unemployed (32.2%). Women employed in unskilled and semi-skilled work (labor, maidservant, daily-wage-workers) were 31.8% followed by 25% women engaged in agriculture (farmers). 155 (70.5%) of the study participants used tobacco in one or the other smokeless form. 29.5% of the study participants never used tobacco in the lifetime. The most common form of smokeless tobacco consumption was Mishri (71.6%) followed by tobacco which was used by 27% of the participants. Supari was also consumed by few of the participants. About 51.4% of the participants consumed >5 g (WHO recommended level) of salt per day. All the participants consumed extra salt in the form of pickle/papad/table salt over and above that consumed in meals. About 8.2% of the study participants were found to be underweight while 21.2% were overweight. About 3.2% of the study participants were in Grade I obesity and only one (0.4%) was in morbid obesity category. 70% of the study participants who had waist-hip ratio ≤0.85, whereas 30% of them had ratio >0.85. Nearly 52% of the study participants gave a positive family history of hypertension among first-degree relatives. Only 22 (68.7%) of those participants diagnosed with hypertension were taking antihypertensive drugs and nearly half of these subjects 12 (54.5%) were taking regular medication. 31.4% of the participants had systolic BP <120 mmHg while 34.1% participants had systolic BP >140 than mmHg (isolated systolic hypertension). 33.3% of the participants had diastolic BP <80 mmHg while 37.2% had diastolic BP >90 mmHg (isolated diastolic hypertension). The mean systolic BP calculated was 130 mmHg with SD 20.7 with 95% CI of mean to be 127.5–132.8 mmHg, whereas diastolic BP was 83 mmHg with SD 11.1 with 95% CI of mean to be 81.7–84.6 mmHg. The overall prevalence of hypertension among the study participants was calculated to be 23.6% with 95% CI to be 18.2–26.8 mmHg. Distribution of the study participants according to the classification of hypertension is shown in [Table 1]. Significant associations were found between the presence of hypertension and various sociodemographic variables using Chi-square test. 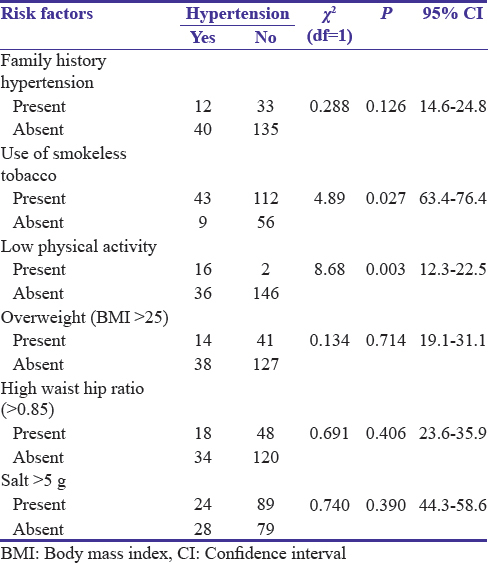 As evident from [Table 2], there was a significant association between hypertension and consumption of smokeless tobacco, low physical activity level. Mean age of participants in the study was 47.3 ± 13.4 years with the age range of 30 years to 80 years. Various studies have been conducted by Thankappan et al., Krishnan et al. and Sinha et al. also fall in the age ranging from 15 years to 80 years.,, A study from rural Andhra Pradesh by Rao et al. reported mean age of the study population 40.59 ± 14.25 which is similar to the current study population. In the present study, a strong positive family history of hypertension was present in 14.5% of overall participants. Rao et al., Agrawal et al., and Kumar et al. reported similar association between family history of hypertension ranging from 6.4% to 9% among women.,, Srinivas et al. reported a strong relation between family history and hypertension, i.e., 42%. This study found zero prevalence of tobacco smoking in females. Rao et al., Agrawal et al., Bhardwaj et al., and Saraswathi et al. also reported similar prevalence.,,, However, Krishnan et al. reported 13% of daily smoking among women. Smokeless tobacco was found to be fairly prevalent, i.e., 70.5% among the women in the current study. The prevalence of smokeless tobacco among women in the current study was higher than other results of studies by Sinha et al., Krishnan et al. and Saraswathi et al., which ranged between 1.2% and 21.7%.,, Anand et al. found that the smokeless form is taken by 12.8% in rural India and that in Maharashtra by 7.7%which is lower than the study. No significant association was found between salt intake and hypertension in the current study. Todkar et al. and Sadhukhan et al. reported significant association between salt and hypertension in their studies., 82.7% of women were physically active in the current study. Thankappan et al., Krishnan et al., Agarwal et al., and Bhardwaj et al. also reported similar results ranging from 7.8% to 17% in females.,,, The results are different from studies reporting low physical activity prevalence of 55% in women by Anand et al. and 78% by Kinra et al., The results are in contrast to Maharashtra (ICMR) study which showed an overall level of low physical activity to an extent of 81%. The study reveals a high burden of hypertension and its risk factors among women of age 30 years and above in a rural community of Maharashtra. This high prevalence reiterates the need to address the burden of Hypertension among women of rural community comprehensively as a part of a Non-Communicable Disease prevention and control strategy. Differential distribution of risk factors among the population needs to be kept in mind while the formulation of such strategy. Further studies are required to assess the prevalence, determinants and preventive interventions of hypertension in rural areas. There is a need for strengthening health education programs promoting hypertension awareness, and emphasizing preventive measures. Multipurpose health workers can be trained for detection and monitoring of hypertension. All such efforts must be coupled with continuing medical education programs for health-care providers to promote awareness of the current guidelines for the diagnosis and treatment of hypertension. World Health Organization. Preventing Chronic Diseases: A Vital Investment. Geneva: World Health Organization; 2005. Available from: http://www.who.int/chp/chronic_disease_report/. [Last assessed on 2018 Mar 23]. Kearney PM, Whelton M, Reynolds K, Muntner P, Whelton PK, He J, et al. Global burden of hypertension: Analysis of worldwide data. Lancet 2005;365:217-23. World Health Organization. Cardiovascular Disease. Factsheet N317. Geneva: World Health Organization; 2013. Available from: http://www.who.int/mediacentre/factsheets/fs317/en/. [Last assessed on 2018 Mar 23]. Yusuf S, Reddy S, Ounpuu S, Anand S. Global burden of cardiovascular diseases: Part I: General considerations, the epidemiologic transition, risk factors, and impact of urbanization. Circulation 2001;104:2746-53. Gupta R. Trends in hypertension epidemiology in India. J Hum Hypertens 2004;18:73-8. Gupta PC, Gupta R. Hypertension prevalence and blood pressure trends among 99,589 subjects in Mumbai, India. Abstr Indian Heart J 1999;51:691. Joseph A, Kutty VR, Soman CR. High risk for coronary heart disease in Thiruvananthapuram city: A study of serum lipids and other risk factors. Indian Heart J 2000;52:29-35. Mohan V, Deepa R, Rani SS, Premalatha G; Chennai Urban Population Study (CUPS No. 5). Prevalence of coronary artery disease and its relationship to lipids in a selected population in South India: The Chennai Urban Population Study (CUPS no 5). J Am Coll Cardiol 2001;38:682-7. Gupta R, Sharma AK. Prevalence of hypertension and subtypes in an Indian rural population: Clinical and electrocardiographic correlates. J Hum Hypertens 1994;8:823-9. Reckelhoff JF. Gender differences in the regulation of blood pressure. Hypertension 2001;37:1199-208. Huffman MD, Engelgau MM. Economic impact of non communicable diseases in India. India Health Beat 2012;6:2-3. Chobanian AV, Bakris GL, Black HR, Cushman WC, Green LA, Izzo JL Jr., et al. The seventh report of the joint national committee on prevention, detection, evaluation, and treatment of high blood pressure: The JNC 7 report. JAMA 2003;289:2560-72. World Health Organization. Obesity and Overweight. Factsheet N 311. Geneva: World Health Organization; 2014. Available from: http://www.who.int/mediacentre/factsheets/fs311/en/. [Last assessed on 2018 Mar 23]. Thankappan KR, Shah B, Mathur P, Sarma PS, Srinivas G, Mini GK, et al. Risk factor profile for chronic non-communicable diseases: Results of a community-based study in Kerala, India. Indian J Med Res 2010;131:53-63. Krishnan A, Shah B, Lal V, Shukla DK, Paul E, Kapoor SK, et al. Prevalence of risk factors for non-communicable disease in a rural area of Faridabad district of Haryana. Indian J Public Health 2008;52:117-24. Sinha DN, Gupta PC, Pednekar MS. Tobacco use in a rural area of Bihar, India. Indian J Community Med 2003;28:167-70. Rao PC, Venkatramana P, Annaiah P, Reddy C. Prevalence and predictors of hypertension in an ethnic population of South India. Anthropologist 2013;15:193-7. Agrawal VK, Bhalwar R, Basannar DR. Prevalence and determinants of hypertension in a rural community. Med J Armed Forces India 2008;64:21-5. Kumar K, Kothari RP, Kothari K, Garg S, Khandelwa M, Gupta R. Prevalence of hypertension in an urban and rural area of Jaipur district. Int J Health Biomed Res 2013;1:120-6. Srinivas S, Satyavaraprasad K, Ramdas G, Krishna CP, Tajuddin R, Rao P. Prevalence of prehypertension in adult population of rural Andhra Pradesh. Asian J Biomed Pharm Sci 2013;3:45-8. Bhardwaj SD, Shewte MK, Bhatkule PR, KhadseJR. Prevalence of risk factors for non-communicable disease in a rural area of Nagpur district, Maharashtra – A who step wise approach. Int J Biol Med Res 2012;3:1413-8. Saraswathi TR, Ranganathan K, Shanmugam S, Sowmya R, Narasimhan PD, Gunaseelan R, et al. Prevalence of oral lesions in relation to habits: Cross-sectional study in South India. Indian J Dent Res 2006;17:121-5. Anand K, Shah B, Yadav K, Singh R, Mathur P, Paul E, et al. Are the urban poor vulnerable to non-communicable diseases? A survey of risk factors for non-communicable diseases in urban slums of Faridabad. Natl Med J India 2007;20:115-20. Todkar SS, Gujarathi VV, Tapare VS. Period prevalence and sociodemographic factors of hypertension in rural Maharashtra: A cross-sectional study. Indian J Community Med 2009;34:183-7. Sadhukhan SK, Dan A. Multifactorial analysis of blood pressure variations in rural community of West Bengal. Indian J Community Med 2005;30:2. Kinra S, Bowen LJ, Lyngdoh T, Prabhakaran D, Reddy KS, Ramakrishnan L, et al. Sociodemographic patterning of non-communicable disease risk factors in rural India: A cross sectional study. BMJ 2010;341:c4974. Indian Council of Medical Research & Indian Council of Medical Research. Non-Communicable Disease Risk Factor Survey, Phase-I States of India, 2007-08. National Institute of Medical Stasistics and Division of Non Communicable Diseases. New Delhi: Indian Council of Medical Research; 2009. Available from: http://www.who.int/chp/steps/2007Report_India_7States.pdf ICMR 2009. [Last assessed on 2018 Mar 23]. Bonita R. Global Health Action Supplement 1; 2009. Available from: http://www.globalhealthaction.net'Home'Vol2(2009) inclSupplements. [Last assessed on 2018 Mar 23]. Gupta R, Gupta VP, Sarna M, Bhatnagar S, Thanvi J, Sharma V, et al. Prevalence of coronary heart disease and risk factors in an urban Indian population: Jaipur heart watch-2. Indian Heart J 2002;54:59-66. Mufunda J, Mebrahtu G, Usman A, Nyarango P, Kosia A, Ghebrat Y, et al. The prevalence of hypertension and its relationship with obesity: Results from a national blood pressure survey in Eritrea. J Hum Hypertens 2006;20:59-65. Danon-Hersch N, Chiolero A, Shamlaye C, Paccaud F, Bovet P. Decreasing association between body mass index and blood pressure over time. Epidemiology 2007;18:493-500.